A second defeat of Scotland in the World Cup qualifying campaign has provided a sense of renewed optimism around the Welsh national team. The 2-1 win at Hampden was a very impressive display from the side, and a source of great hope, even if they remain a long way off the group pace-setters Belgium and Croatia. It was always going to be tough; that's the nature of competitive home nation ties. But having won two of their last three games, Wales played with a new-found confidence. Scotland are always strong at Hampden Park with the tartan army behind them, and going into the game they were unbeaten in their last seven games on Scottish soil. Furthermore, injuries had deprived Chris Coleman of a couple of key men, the most influential perhaps being Liverpool's Joe Allen. Allen has not been hitting the heights he did for Swansea City last season, but he is integral to the Welsh side and will always be missed. Other notable absentees were Adam Matthews and Steve Morison. Coleman stuck with the 4-5-1 formation he has favoured since taking charge, although it was a more flexible variation because of the individuals selected. Hal Robson-Kanu and Jack Collison occupied the flanks, with Gareth Bale taking a more central role behind Craig Bellamy. This change pushed Aaron Ramsey further back into a deep-lying role, in which he acted as playmaker, Joe Ledley holding alongside him in central midfield. This was certainly a positive selection from Coleman, who had perhaps identified the movement of the front four as a feature that could unsettle the Scottish backline. Early indications suggested Coleman had got his selection spot on. Wales dominated the opening 20-30 minutes, taking the greater share of possession - 78% in the first 15 minutes. They passed the ball brilliantly, Aaron Ramsey thriving in a deeper position that afforded him greater time on the ball. The movement of the front four was unpredictable, and it made for some great intricate play on the fringes of the final third. However, for all the possession Wales had in the first half they failed to convert, lacking a real goal-scoring target - with Bellamy regularly dropping into deeper positions in an attempt to dictate play. When you are in the ascendancy you must capitalise or you will get punished, and Wales did in first-half added time when Grant Hanley managed to do enough to lose Sam Ricketts and gave Scotland a fortuitous 1-0 lead at the break. 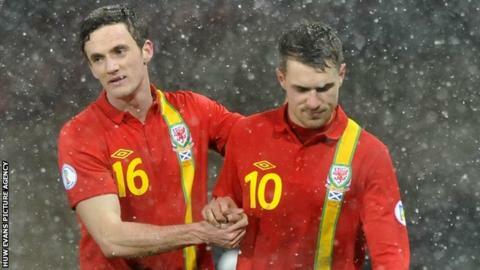 Another plus for Wales was the display of 19-year-old Johnny Williams who replaced Gareth Bale. This was to be the Crystal Palace youngster's moment to shine and he turned in a second half performance of the highest quality. The Welsh team recovered well from a shaky period at the start of the second half, with possession based football once again providing the side with momentum. Integral to this was Johnny Williams who offered a certain creativity that was lacking in the opening half. Ramsey dispatched his penalty brilliantly, and Williams was impressive in the build-up to the winning goal, gliding past the Scottish midfield before playing a pass to Andy King on the right hand side. King's delivery was brilliant, and Hal Robson-Kanu delivered a header to match in putting Wales 2-1 up. It was no more than the Welsh lads deserved. Ramsey's red card for a cynical foul is a big disappointment, as he really impressed in the deeper role. However, that was one of the very few downsides in a thoroughly impressive Welsh display. Every player deserves credit, as does manager Chris Coleman for his selection. It takes time for a manager at international level to really get across to his players, but the signs are there that Chris Coleman is settling in well a year on from his appointment. Three precious points leaves Wales third in Group A, seven points off leaders Belgium and Croatia. Whilst qualification looks a long way off, there is new hope for a Welsh side that will go into Tuesday's game against Croatia with the confidence that they can take a positive result.